“This time last year,” I thought. For the voice, asking its rather staggering questions over the long-distance wire, yesterday, was the same voice that had telephoned this time last year, almost to a day. It belongs to a friend who has spent a good many years in public life and public service. There was the same tenseness in his voice now as there had been a year before, but for reasons as different as if, in the meantime, the world had spun over on its axis and reversed its poles. Then the voice had seemed to me curiously optimistic (the Hungarian revolt was on). 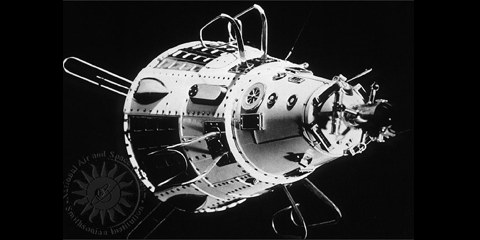 Now it seemed to be speaking from the bottom of a pit (Sputnik II had been launched the day before). Until that moment, I had not realized, could scarcely have believed possible, the degree of alarm that the second Communist moon had stirred in the West. The voice said: “Suppose the Russians have one hundred rockets of the thrust that launched the second Sputnik, 1 and that the rockets have hydrogen warheads. Suppose they are trained on the United States. Will the Russians first give us an ultimatum in the hope of taking our technology intact? Or will they launch the rockets without any ultimatum? Certain quarters,” the voice went on, “have put that question to their Communist experts. What would your answer be?” As put to me, it was a purely personal, unofficial question; I am not a Communist expert. Perhaps that is why, instead of reaching for a graph, I thought: “This time last year.. ” Let us remember that time a little, because it bears both on my friend’s question and my answer. This time last year, I came out of my workroom, one morning, to find my wife waiting, shaken and distracted, just outside. “They’ve come back,” she said. “They’re bombing the city. It’s horrible.” It was Sunday, November 4, 1956. The Soviet armor had wheeled back on Budapest. We listened to the pleas for help from the Hungarian resistance radios; boosted, rebroadcast or paraphrased by the stations of the West. One appeal broke off: “May God help you and help us.” “At that point, the Hungarian station went off the air,” said the American announcer’s Sunday voice comes out like a ribbon, lies flat on the brush. At that point, in fact, the man with the tommy-gun had kicked in the door, and it required no imagination at all to know what had happened next in that Hungarian studio. My wife burst out: “Why don’t they stop those horrible commercials! Why don’t all the stations pray, why doesn’t everyone simply pray to God to help the Hungarians? Poor people, oh, poor, poor people!” She rocked back and forth silently in order not to give way further to her grief. I said nothing. I was thinking of what the West would do, or, as I surmised, would not do, with this historic opportunity. I was remembering certain words of Lenin‘s at the great turning-point of this century. He was warning his sluggard henchmen that history sometimes gives men one chance, and that it seldom gives them a second chance; that, for resolute and intelligent men, given that chance, not to seize and act upon it is “crime”; that “to temporize is like death,” “to temporize is death.” This time last year, the temporizing UN was trying to try to push through a resolution condemning the Hungarian horror; was screaming moral indignation, though somewhat like the duck in Peter and the Wolf, “from the middle of the pond.” This time last year, the voice that telephoned me yesterday called from Washington to ask hopefully: “What do you think? Will we intervene in Hungary?” I said: “No intervention. The people are afraid it means world war. If you could put it to a vote, you would not get one thousand votes for intervention in the whole country.” The figure might just as well have been one million votes without in any way changing the fact. This is not because the center of political gravity in the satellite situation lies in Hungary. Events are likely to disclose that it lies, as it has from the first, in Poland and in the Germanies (West as well as East). Least of all is it, as we have so often heard of late, because Soviet action in Hungary has at last stripped the mask from Communism and revealed its true face. Anybody who had to wait for Budapest to tell him that does not know what century he has been born into. Nothing has happened in Hungary by way of horror that has not happened repeatedly within the Communist Empire, and more humbly. Millions of Russians (let us remember) have already been destroyed, defying Communism. Their struggle and their cries were lost in the distances of Euro-Asia. But we heard the Hungarians, and they tore at least at our nerves. Those cries command our attention first to a challenge that is as simple as it is timeless. All other factors change or fade — the politics, economics or their catchwords that men defied or defended. But resistance enacts a human meaning that is always the same. It says that when man, the sufferer, rises by courage above the odds of pain, he liberates by his act the one force that brute power, destroying all else, is powerless to destroy. There is more. To the exact degree in which brute power is most incontinently brutal, those who resist compel it to collaborate in dramatizing that meaning. That done, resistance, though it can be crushed, cannot be defeated. Disaster is not defeat. Resistance outlives disaster because the sons remember the fathers, and that memory is caught at again and again by others who suffer, and whom it moves to dream of resisting in their turn. This is the dialectic of hope; it stirs in darkness. But there is not just one challenge. There are two of them. It is not only Soviet power that the Hungarians have challenged. They also confront the West with a challenge equal to, or greater than, their challenge to Communism. The history of the past forty years has been marked by this incongruity: that Communism, permanently strife-torn and precarious, and weak in most material ways beyond anything imaginable to the average experience of the West, has repeatedly stood off or scored off a West in most material ways immensely more powerful. Until Communism detonated its A and H Bombs, it was never a question of comparative power. Power, on the part of the West, was never lacking. Will was lacking. And that failure of will was matched by a failure of intelligence, taking form as an inert complacency, varied recurrently by sweeps of illusion that Communism was about to change into the exact opposite of what it is, into the opposite of all that has given it power and empire, into something more like that image that the West cherishes of the West, something more eligible for the garden party guest-list. This of the most consistently implacable revolution in history. It is to that failure of will and intelligence in the West that the Hungarians have cried: ‘Halt!’, challenging it to reverse its forty-year retreat by giving it precisely what most it dreads — an opportunity. But at last I pushed those pages to one side. Who, in the West, would read in them anything but overblown feeling; as if revolution for Communism or against it, were ever made by anything less than feeling, running molten under the pressures of necessity. But feeling does not, as one of our fondest notions has it, keep·the measuring mind from measuring narrowly the reality of what it feels about. I knew before I had finished writing that, within weeks, what I was writing about would be as dated as if it dealt with another age. If the Russians have one hundred ICBMs trained on us and mean to use them-then, in my fallible opinion, you can be quite sure that there will be no ultimatum. The Russians will launch the rockets first and talk afterwards, if there is anybody left worth talking to. On the other hand, again in my fallible opinion, the Russians do not have one hundred such rockets trained on us. Nor do I believe that such saturation attack forms any part of over-all Communist strategy at this time. Communist strategy seems to me to have quite different procedures and ends in view, geared to a close, forty-year scrutiny and experience of the West. “For once,” said the voice, brightening, “you are more hopeful than I am.” I said: “That is not hope.” I meant this: Budapest convinced me that the will and intelligence of the West are still unequal to what besets them, and this regardless of the sumptuousness of our retaliatory power. What price retaliatory power if, having it, you must stand by, lacking the will or ingenuity to improvise “even a gun-running service for us”? I take it to be a matter of simple fact that the retaliatory power of the Strategic Air Command still offsets any temporary thrust ahead of Communist rocket prowess — as the President has assured us in the first of his “chins-up” talks. Retaliatory power is a simple necessity of survival. But retaliatory power keeps rocketing into ever more terrifying stages of stalemate. And there is probably a limit, not easy for the layman to grasp, beyond which these sprints into progressive stalemate can sprint no farther. Even now, neither side dares break the relative stalemate except in the certainty of consequences so frightful that imagination rejects as pointless the effort to picture them. Forward motion in either direction would seem, therefore, to lie outside the central stalemate. This is a revolutionary conflict we are locked in, and, in it, we are, perforce, compelled to act as much as revolutionists as the enemy, though in a different way. For victory must presumably go to him who succeeds in overleaping or bypassing the weapons stalemate, and swinging to his side decisive population masses and their economies now beyond his control. This is the strategic thrust of the theses of the 20th Congress of the Soviet Communist Party, now personified in the leadership of Nikita Khrushchev. That is what, at the moment, the Middle East is about. This is why what I can see by Sputnik II’s dim light alarms me less than it alarmed my telephoning friend and millions of others. It is why, instead, I look back from Sputnik II to Hungary, this time last year. Some years ago, I met in an unlikely executive office, high in a New York skyscraper, a little group of men, introduced namelessly as leaders in America of a Hungarian resistance movement. I did not know why we had met and I do not know now. The modem world is like that. But suddenly the spokesman for the rest asked me: “Do you know what is America’s secret weapon?” I said: no. He brought his hand with unexpected force against his chest as he answered: “We, we are your secret weapon.” In the days of Budapest, I thought often of that odd conversation. I thought, too, that, if we were holding it again, I should have put a question in my turn. I should have asked: “Do you think we shall know how to use our secret weapon?” But I should have spared them from answering by answering myself: “Neither do I.” The moment when the West, by action, has made that answer untrue, will, I suspect, mark a turn in history quite as decisive in its way as Sputnik II.